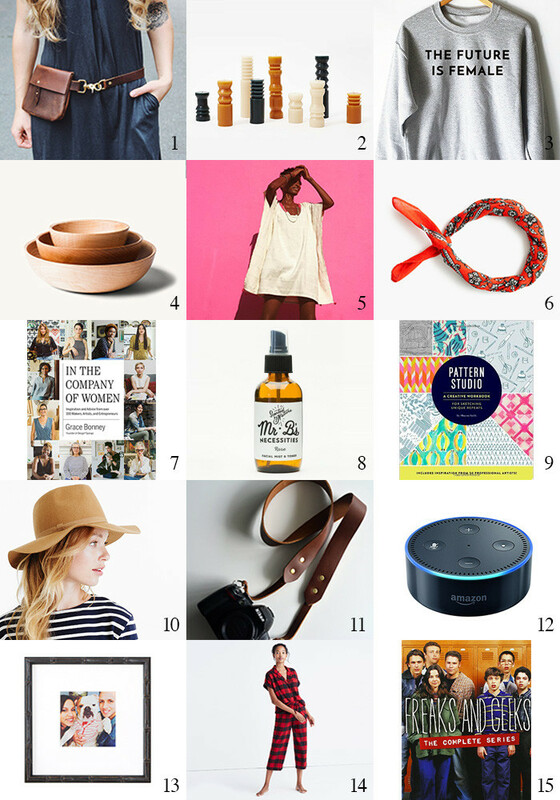 This week will bring gift ideas for her, for him, for the kiddo, and for everyone else. Let’s get started! 1. An updated leather fanny pack, because they’re back—and because you want to tell her you know she has her hands full. 2. Totem candles to up her shelfie game. 3. “The Future is Female” sweatshirt, with 25% of the price going to Planned Parenthood. And, if you can swing it, a recurring donation in her name to support women’s reproductive rights. Consider, again, Planned Parenthood or the Center for Reproductive Rights. 4. Gorgeous turned hardwood bowls. They go with everything, and she’ll think of you when she uses them all the time. 5. A Caftan from L.A.-based Salty + Pine that can be worn over a bathing suit or layered over jeans, because it’s that cool. 7. In the Company Of Women—a collection of interviews with creative entrepreneurs, for the aspiring and the already inspiring woman. 8. A little bottle of Rose Facial Mist & Toner because she loves the smell. 9. Pattern Studio. Taking the coloring book to the next level. 11. A leather SLR camera strap because you want to support her interests—and her talent! 13. Something framed from their feed. P.S. I love looking back at past guides for inspiration as well. I checked all of these for broken links, adding updates where needed, and still stand by every suggestion for this year as well! 2015 For Her, 2014 For Her, and 2013 For Her. And all the others in the archives. What's your Thanksgiving Dinner Style?